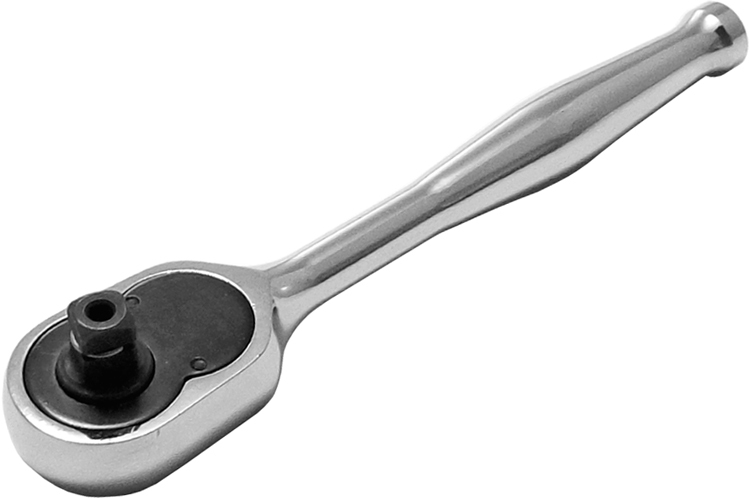 Reversible Hi-Lok® hand ratchet wrench with 1/4'' male square drive with through hole for hex keys. Hi-Lok® hand ratchets from Omega Technologies are manufactured from high quality materials and nickel-plated for durability. Omega Hi-Lok® hand ratchets are suited for a wide range of installations, including Hi-Lok® systems. Hi-Lok® hand ratchet wrench, reversible 1/4'' male square drive with through hole for hex keys up to 3/32'' (.094''), 72 teeth for tight action. Replaces HLH101-21 , HLH 101-250, ZATHR250, ATSK3594. Flex-head, or swivel-head Hi-Lok® hand ratchet wrench, reversible 1/4'' male square drive with through hole for hex keys up to 3/32'' (.094''), 42 teeth. Replaces ATI ATSK3744, Snap-On® TFY936. Hi-Lok® hand ratchet wrench, reversible 3/8'' male square drive with through hole for hex keys up to 5/32'' (.156''), 72 teeth for tight action. Replaces HLH101-23, HLH 101-375, ZATHR375, ATSK3595. Hi-Lok® hand ratchet wrench, reversible 1/2'' male square drive with through hole for hex keys up to 1/4'' (.250''), 36 teeth for tight action. Replaces HLH101-25, HLH 101-500, ZATHR500.